Curry – that most British of foods and possibly the most non French. A few days ago I decided to have a curry bash and invite a few folks. 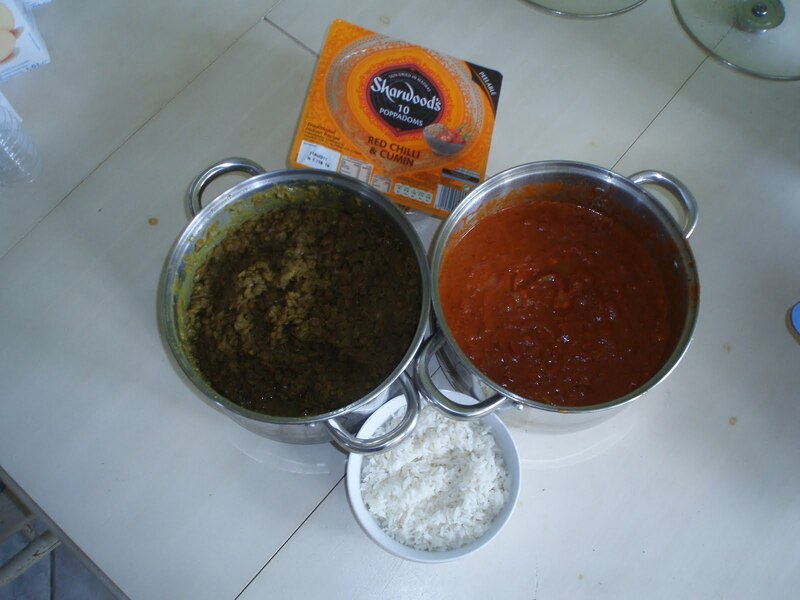 All morning I have been mixing and matching Balti, Madras and Korma sauces. I’ve drained the dahl, browned the boeuf and chopped the chicken. Nothing can go wrong! As I wait for the event to start I try not to think about those very few occasions when dinners and soirées have – well – needed on the hoof adjustments. I think the worst food was when I had decided to serve whitebait as a starter for the first time. I dumped a big wedge in a hot wok and dug them out as a kind of mashed fish block. I just told the guests it was high fibre pate with eyes. But probably one of the worst dinner parties I ever held was when I was a member of the Socialist Workers Party. Comrades were always ravenous and survived on dry crusts and revolution jam. What they didn’t know was that I had only joined because I just wanted to be a member of SOMETHING. A guy came round selling his revolutionary newspaper and told me I was a down trodden daughter of toil. I was young with kids, debts and a bum job so it rang a bell. When the comrades found out I had a gas stove and a saucepan I kinda became a culinary apparatchik, but with the emphasis on the chick. If these guys had overthrown the government and seized power, a citizens’ committee would have appointed ME as ministress of cuisine (except that would have been both sexist and bourgeois). So, the comrades came for dinner. Talk was intellectual and inflamed with hatred of the Trots, Communists and the league of General Purpose Reds. WE were the only pure Socialists. I was really pleased that I had joined up with the right stuff because I wasn’t sure if I was a communist or not and I could just have easily fallen in with them. As dinner ended, the bearded head comrade stood and indicated that we should all stand and sing a song called “The Internationale”. Well, I guess all you guys out there know the words (check it out here). The comrades clenched fists and sang through what seemed like an hour of revolutionary fervour, all the while glaring at me and I tried to mime, hum and control nervous giggles. By this time my horny handed husband of toil was on the phone to the Maggie Thatcher to see if they could send in the Army. (That poor man – he just had to take so much of my nonsenses and fads). I think I was the first person they had met who didn’t know the words. Now – If they’d gone for Abba I’d have sung “Fernando”. And whilst the echoes of the Internationale still resonate in my memory, I watched a small section of the Tour of Spain cycle race yesterday. In the commercial break they ran ads for Pay Day loans and ambulance chasing lawyers. To me it just kinda painted a picture of what’s going on and how we are. Curry time approaches. At least I know how to sing “La Marseillaise”. Emma thinx: Revolution – 360 degrees of Elites. This entry was posted in Cooking, Emma Calin, English Working Class Life, Food, France by emmacalin. Bookmark the permalink.